First: I don’t know if I’ve actually mentioned this or not but…I’m not promoting these books in order to get royalties. I know some folks think you get rich writing books (and ask any author, that usually doesn’t happen unless your name is Stephen King! )….but I know the reality. Lots of authors out there keep their day jobs! I’ve committed to God that I don’t need income from the book. For me, the work that went into these books is an act of love and devotion, and it’s a ministry to help other Christians deepen their faith. Even events and other promotional work is being done without profit beyond basic expenses like travel – I’ll even be donating a big chunk of any royalty checks to charity. I’ve seen lots of folks get tripped up becoming reliant on income from ministry products they sell, and while I don’t begrudge anyone an income, I want to keep my motives clear of profit motives. However – I DO keep talking about the books because I really believe they’ll be helpful! If I didn’t think so, I wouldn’t be jumping around waving my hands in the air, asking people to look at the book site. 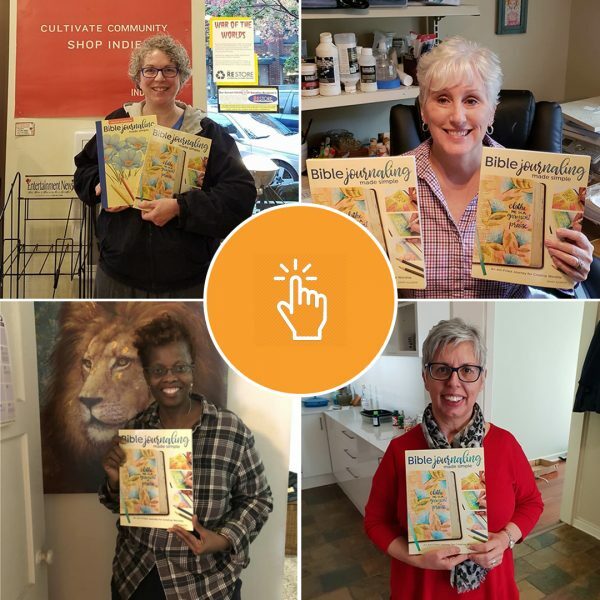 There’s great resources over there, including links to get the books, galleries of samples and sketches, videos, etc – and I have SO appreciated everyone who’s been sending the link out to their friends, churches, and ministry groups, sharing reviews on websites after purchasing the books, and sending me pics of themselves with DA BOOKS! FYI the books do make great Christmas gifts. Add a pack of colored pencils or a little watercolor set and make Mom’s morning on December 25th! What? Me, teaching a class? I’ll be teaching at Daniel Smith! I’ve been on a long hiatus from any in-person teaching, partly because I’m not enjoying travel very much any more. But this doesn’t require anything more than a drive to Seattle, and it’s a straight-up art class….which makes me very happy! (No kits!) They’ve been after me to teach watercolor there for a while, but I still am not confident enough that on a particular day I can create a specific type of painting as a teacher – if you follow my instagram, you know I’m all over the place, sometimes washy, sometimes tight, sometimes halfway in between. (And you don’t even see the messes I make in between!) So I’ve been reticent to do any teaching there. Artists in all mediums have a common challenge: creating a work that truly communicates what the artist is trying to express! How does a landscape, portrait, or other piece of art “speak”? As artists, we can learn to develop our message, create it intentionally, and speak clearly to our viewers through a sheet of paper or a canvas! Artist and author Sandy Allnock will discuss communication through placement, editing, value, color, and more. “Before and after” examples will show the impact of these artist tools, and will demonstrate in a variety of mediums, including pencil, watercolor, and Copic marker. Students will be filling their sketchbooks with very quick studies from photographs to apply learnings, and interactive reviews of student work will instruct the whole class, too. No “finished” art will be created, but resource photographs will be provided for individual development of artwork following class as desired. Students of any medium and at any level can benefit from this workshop. It’s recommended that students bring an adventurous spirit: this class will encourage deep thinking and quick sketching! Sketchbook: Bring one that’s 9×12 (or larger) – paper should be appropriate for mediums to be used. Instructor will use a Bee Paper (mixed media) sketchbook but most anything will work for this class. Sketching medium: whatever you prefer for sketches of approximately 5×7 size. Soft sketching pencils (6B+), conte crayons, etc. 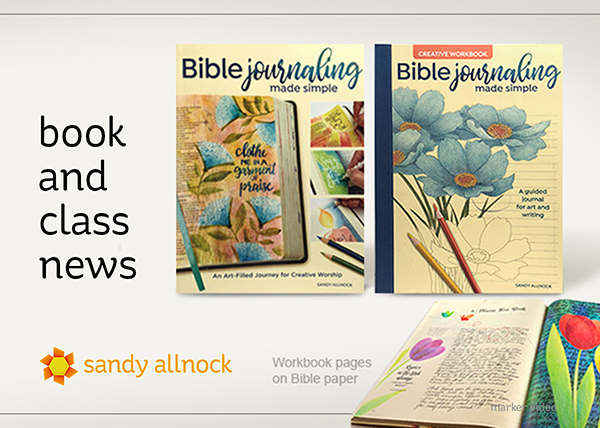 I ordered both the book and workbook from your link to Amazon – and am excited to say at least one of them will arrive on Saturday, maybe even both of them. I saw your 101 class ofference and am considering. I was wondering if it enhances the books. I’m taking your jumpstart colored pencils and watercolor classes as well and enjoying them. I’m hoping that these books will help me study the Word – I am 64 and have never been very good at studying or taking notes – hoping I can learn. Thank you! The classes do add to the books – the 101 is all about mediums, and you can read the descriptions of all them. Oh wow, if only I lived in the US! I’d love to take an in person class with you! I just ordered the book today through the independent bookseller in my town (I’m happy to spend my dollars locally!). I am so looking forward to having it in my hands! Sandy, you are such a great teacher for us, so everyone who can take that class ( I can’t I live in The Netherlands) are very lucky! I so want to take this class, my sisters live in seattle so I must plan a visit! I appreciate all you share.